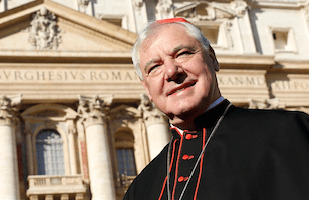 If there is a forerunner of this “Manifesto of faith” from Cardinal Gerhard Müller. released today all over the world, it is the “Credo of the People of God” proclaimed in 1968 by Paul VI. Then as now, the Church was in a tempest and its very faith was wavering. Paul VI felt it his duty to reaffirm the pillars of Church doctrine. Today, giving this public testimony of faith is the cardinal who was prefect of the congregation for the doctrine of the faith from 2012 to 2017. As an outline for the “Credo of the People of God” Paul VI adopted the “Credo” of the council of Nicaea. Cardinal Müller has instead taken as the guideline for this “Manifesto of faith” the Catechism of the Catholic Church, to which the numbers in parentheses in the text refer. With the following “Manifesto” Cardinal Müller intended to fulfill today this mandate of the apostle to his disciple. The task of the Magisterium of the Church is to “preserve God’s people from deviations and defections” in order to “guarantee them the objective possibility of professing the true faith without error” (890). This is especially true with regard to all seven sacraments. The Holy Eucharist is “source and summit of the Christian life” (CCC 1324). The Eucharistic Sacrifice, in which Christ includes us in His Sacrifice of the Cross, is aimed at the most intimate union with Him (CCC 1382). Therefore, the Holy Scripture admonishes with regard to the reception of the Holy Communion: “Whoever eats unworthily of the bread and drinks from the Lord’s cup makes himself guilty of profaning the body and of the blood of the Lord” (1 Cor 11:27). “Anyone conscious of a grave sin must receive the sacrament of Reconciliation before coming to communion” (CCC 1385). From the internal logic of the sacrament, it is understood that divorced and civilly remarried persons, whose sacramental marriage exists before God, as well as those Christians who are not in full communion with the Catholic Faith and the Church, just as all those who are not disposed to receive the Holy Eucharist fruitfully (CCC 1457), because it does not bring them to salvation. To point this out corresponds to the spiritual works of mercy. United in faith and prayer. The pope, either Pope Emeritus Benedict or him who is thought/believed to be Pope by the “vox populi” should, without hesitation, put his seal of approval on this declaration of faith (or better yet, publicly make/state it himself).